This download (S4-M25.zip) was tested thoroughly and was found 100% clean. Click "Report Spyware" link on the top if you found this software contains any form of malware, including but not limited to: spyware, viruses, trojans and backdoors. Simple Scheduling Calendar 1.24 - Schedule your employees to shifts and tasks on a simple calendar for a month. Schedule Multiple Shifts Automatically 7.11 - Automatic Monthly Shift Schedules for 10 Shifts and 50 Employees with Excel. 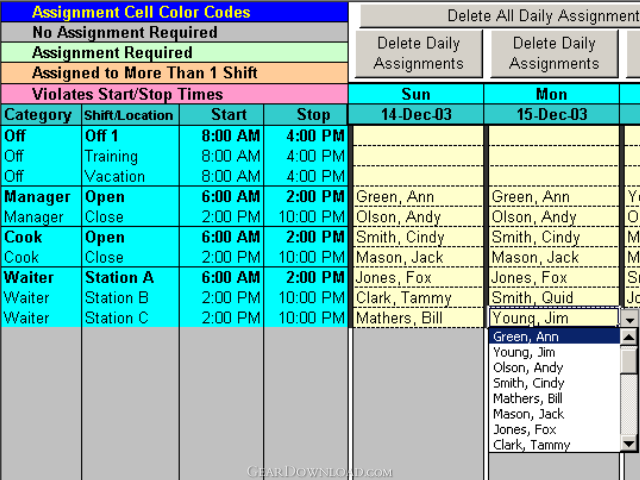 Rotating Shift Schedules for Your People 5.24 - Rotating or Fixed Shift Schedules for 10 People for 52 Weeks with Excel. Schedule Split Shifts for 25 Employees 6.8 - Assign Daily Split Shifts to 25 Employees with Excel. Daily Shifts and Tasks for 25 Employees 3.98 - Create daily shift and task schedules for one week with Excel spreadsheet. Daily Calls and Tasks for 20 Doctors 1.85 - Schedule 4 daily calls and 50 daily tasks to 20 doctors for one year. Doctors Calls for a Year with Excel 4.16 - Excel spreadsheet for assigning up to 5 daily calls to 25 doctors for one year. Schedule Crew Assignments for 100 People 3.21 - Create job-specific work crews that may change in composition from day-to-day. Create Floor Schedules for Your Agents 3.92 - Automatically Schedule Real Estate Agents to Monthly Floor Schedules with Excel.